Tackle your challenges with this free guide! From implementing an employee survey to driving organizational change, improving employee engagement can be challenging. Do you lack time or resources? Or is getting buy-in from employees and leadership a struggle? 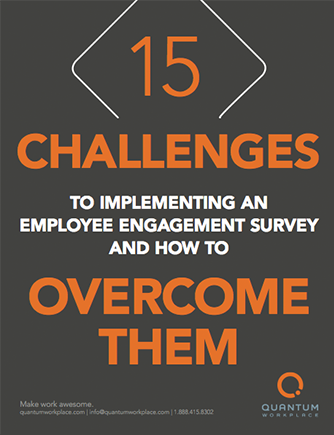 This ebook addresses the 15 most common employee engagement challenges we’ve heard from working with more than 5,500 organizations. Don’t let the obstacles get in your way. The benefits engaged employees will bring your organization are more than worth facing up to the challenge! Get your copy today, and share it with colleagues who are having difficulty with employee engagement in their organizations.